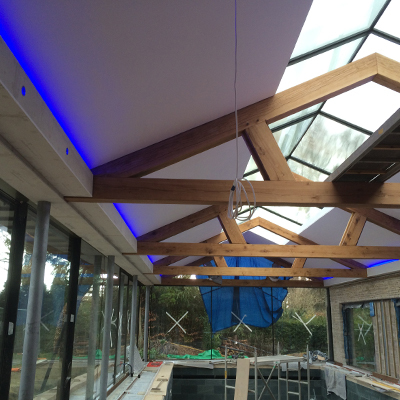 Our client on this pool house project initially got in contact with us regarding the main electrical installation. Upon meeting and going through the project requirements he mentioned that they had been interested in putting home automation into the building but was put off by the costs which they had received from other companies. We introduced the client to Loxone and they were suitably impressed by the design and ease of the control via the Loxone App.  They asked us to provide a costing for automating the buildings heating and lighting and once we got back to them they couldn’t believe the affordability and ask us to go ahead and start designing our electrical installation to incorporate Loxone. The project is currently on going but once complete all the buildings heating and lighting will be fully controllable via Loxone. Including the ability to heat up their hot tub via their phone on the way home and are able to instantly wind down after a long hard day. For this stylish, modern kitchen renovation the clients wanted us to install a lighting control system in which they could control the lighting from their phone or tablet. We promptly recommended them to install Loxone as the ideal system for their needs. Together with the clients we immediately set about designing the lighting and installing a number of lighting circuits which would allow them to light certain areas to create different scenes. 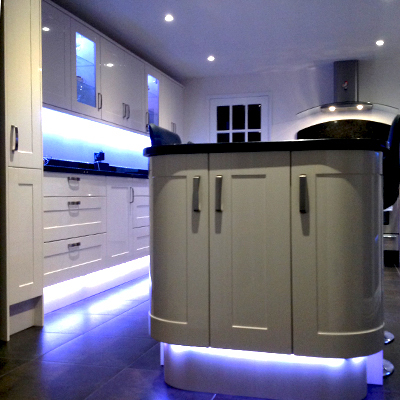 Once installed the clients were able to individually control each lighting circuit from both their phone and tablet and were also able to scroll through a whole spectrum of different lighting colours for their cupboard and plinth lights to suit their mood. We were also able to program in different preset lighting scenes including, breakfast, cooking evening and the all-important party scene for when entertaining their guests. Loxone is now installed in their house and they are hoping to, in the future, expand the system to control their heating, helping them to run their heating system more efficiently and, of course, save money on utility bills.